When we think about great blues there are some obvious places that come to mind; Chicago, Memphis, the delta and Iowa. Yes Iowa! In recent years the list of amazing blues artist coming from the heartland continues to impress, and “The Avey/Grouws Band” is the latest group causing blues lovers to sit up and take notice. Winners of the 2017 Iowa Blues Challenge, The Avey/Grouws Band took their powerful sound to the International Blues Challenge in Memphis Tn. and filled the clubs with it’s hard hitting soul filled sets, making it all the way to the semifinals. That journey to the international Blues Challenge started in DesMoines during an Iowa Blues Challenge qualifier, and now Avey/Grouws will hit the stage in Fairfield, to treat fans to a night exploring rock and blues grooves at the Best Western Fairfield Inn Saturday November 10th presented by The Southeast Iowa Blues Society. After a string of dates through the mid-south, Avey/Gouws returns for select dates across the Midwest before their winter tour of Florida. 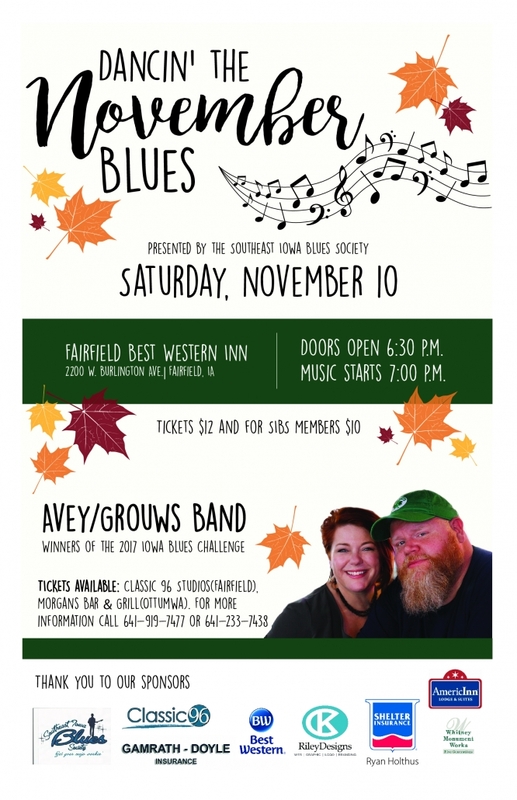 The Southeast Iowa Blues Society date is one of only 3 Iowa dates on this latest tour. Tickets for The Avey/Grouws Band are just $12 or $10 for Blues Society Members and available at the Classic 96 Studios in Fairfield or Morgan’s Corner Bar and Grill in Ottumwa and by calling 641-919-7477.